John Cage (September 5, 1912 – August 12, 1992) was an American composer. A pioneer of chance music, electronic music and non-standard use of musical instruments. Cage was one of the leading figures of the post-war avantgarde and, in the opinion of many, the most influential American composer of the 20th century. I can't speak or write German, but I'am overjoyed because I have bought one of your pictures. Now it is in me. I write music. You are my teacher. Wherever we are, what we hear is mostly noise. When we ignore it, it disturbs us. When we listen to it, we find it fascinating. The sound of a truck at fifty miles per hour. Static between the stations. Rain. We want to capture and control these sounds, to use them not as sound effects but as musical instruments. Every film studio has a library of "sound effects" recorded on film. With a film phonograph it is now possible to control the amplitude and frequency of any one of these sounds and to give to it rhythms within or beyond the reach of the imagination. Given four film phonographs, we can compose and perform a quartet for explosive motor, wind, heartbeat, and landslide. Quote of John Cage, in: 'The Future of Music: Credo' (1937); in: 'Silence: lectures and writings by Cage, John', Publisher Middletown, Conn. Wesleyan University Press, June 1961, V. ...WHEREAS, IN THE PAST, THE POINT OF DISAGREEMENT HAS BEEN BETWEEN DISSONANCE AND CONSONANCE, IT WILL BE, IN THE IMMEDIATE FUTURE, BETWEEN NOISE AND SO-CALLED MUSICAL SOUNDS. THE PRESENT METHODS OF WRITING MUSIC, PRINCIPALLY THOSE WHICH EMPLOY HARMONY AND ITS REFERENCE TO PARTICULAR STEPS IN THE FIELD OF SOUND, WILL BE INADEQUATE FOR THE COMPOSER, WHO WILL BE FACED WITH THE ENTIRE FIELD OF SOUND. The composer (organizer of sound) will be faced not only with the entire field of sound but also with the entire field of time. The 'frame' or fraction of a second, following established film technique, will probably be the basic unit in the measurement of time. No rhythm will be beyond the composer's reach. I remember loving sound before I ever took a music lesson. And so we make our lives by what we love. A finished work is exactly that, requires resurrection. Quote of John Cage from Forerunners of Modern Music (1949), first published in the New York journal A Tiger's Eye, later collected in Silence. Are the people inside the school musical and the ones outside unmusical? "Communication", the third of the Composition as a Process lectures, John Cage gave in Darmstadt in 1958 and published in Silence. So it was that I gave about 1949 my 'Lecture on Nothing' at the Artists' Club on Eighth Street in New York City (started by Robert Motherwell), which predated the popular one associated with Philip Pavia, Bill de Kooning, et al. ). This 'Lecture on Nothing' was written in the same rhythmic structure I employed at the time in my musical compositions (Sonatas and Interludes, Three Dances, etc.) . One of the structural divisions was the repetition, some fourteen times, of a single page in which occurred the refrain, 'If anyone is sleepy let him go to sleep.' Jeanne Reynal, I remember, stood up part way through, screamed, and then said, while I continued speaking, 'John, I dearly love you, but I can't bear another minute.' She then walked out. Later, during the question period, I gave one of six previously prepared answers regardless of the question asked. This was a reflection of my engagement in Zen. At Black Mountain College in 1952, I organized an event that involved the paintings of Bob Rauschenberg, the dancing of Merce Cunningham, films, slides, phonograph records, radios, the poetries of w:Charles Olson and M. C. Richards recited from the tops of ladders, and the pianism of David Tudor, together with my 'Juilliard lecture', which ends: 'A piece of string, a sunset, each acts.' The audience was seated in the center of all this activity. Later that summer, vacationing in New England, I visited America's first synagogue, to discover that the congregation was there seated precisely the way I had arranged the audience at Black Mountain. Critics frequently cry 'Dada' after attending one of my concerts or hearing one of my lectures. Others bemoan my interest in w:Zen. One of the liveliest lectures I ever heard was given by Nancy Wilson Ross at the Cornish School in Seattle. It was called Zen Buddhism and Dada. It is possible to make a connection between the two, but neither Dada nor Zen is a fixed tangible. They change; and in quite different ways in different places and times, they invigorate action. What was Dada in the 1920's is now, with the exception of the work of Marcel Duchamp, just art. What I do, I do not wish blamed on Zen, though without my engagement with Zen.. .I doubt whether I would have done what I have done. . .I often point out that Dada nowadays has in it a space, an emptiness, that it formerly lacked. What nowadays, America mid-twentieth century, is Zen? I certainly had no feeling for harmony, and Schoenberg thought that that would make it impossible for me to write music. He said, 'You'll come to a wall you won't be able to get through.' I said, 'Well then, I'll beat my head against that wall.' I quite literally began hitting things, and developed a music of percussion that involved noises. There is one term of the problem which you are not taking into account: precisely, the world. The real. You say: the real, the world as it is. But it is not, it becomes! It moves, it changes! It doesn’t wait for us to change.. .It is more mobile than you can imagine. You are getting closer to this reality when you say as it 'presents itself'; that means that it is not there, existing as an object. The world, the real is not an object. It is a process. When I hear what we call music, it seems to me that someone is talking. And talking about his feelings, or about his ideas of relationships. But when I hear traffic, the sound of traffic — here on Sixth Avenue, for instance — I don't have the feeling that anyone is talking. I have the feeling that sound is acting. And I love the activity of sound.. .I don't need sound to talk to me. They say, 'you mean it's just sounds?' thinking that for something to just be a sound is to be useless, whereas I love sounds just as they are, and I have no need for them to be anything more than what they are. I don't want them to be psychological. I don't want a sound to pretend that it's a bucket or that it's president or that it's in love with another sound. I just want it to be a sound. What I'm proposing, to myself and other people, is what I often call the tourist attitude - that you act as though you've never been there before. So that you're not supposed to know anything about it. If you really get down to brass tacks, we have never been anywhere before. I once asked Aragon, the historian, how history was written. He said, 'You have to invent it.' When I wish as now to tell of critical incidents, persons, and events that have influenced my life and work, the true answer is all of the incidents were critical, all of the people influenced me, everything that happened and that is still happening influences me. I'm especially interested in the music of John Cage.. ..I would like to do some experimenting with the relationship between his freeform sound and [my] free-form art. Object in/ and space – the first impulse may be to give the object – a position – to place the object. (The object had a position to begin with.) Next – to change the position of the object. – Rauschenberg's early sculptures – A board with some rocks on it. The rocks can be anywhere on the board. - Cage's Japanese rock garden – The rocks can be anywhere [within the garden]..
Once, I made a kind of sculpture of a flag in bronze: it was an edition of three, I think. One of them was given on some occasion to President Kennedy. I became very upset that this was happening. It was given on Flag Day! (he laughs). It seemed to me to be such a terrible thing to happen. 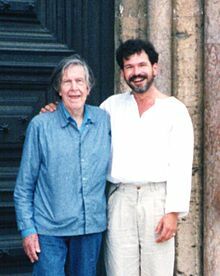 I complained bitterly to my very good friend John Cage. He said: "Don't let it worry you. Just consider it as a pun on your work". (he laughs). I met Cummingham around 1953 after a performance I saw. He was teaching and making dances for his company and was already working with John Cage. What interested me initially wasn't just the movement but also the music he worked with, which was unfamiliar to me.. .Later Bob Rauschenberg had been doing sets and costumes for the Cunningham Company.. .I can't say exactly how, but for a period of time, Cage, Cunningham, Rauschenberg, and I saw each other frequently and exchanged ideas. John [Cage] was very interested in presenting his ideas to other people, so it was impossible to be around and not to learn.. .He could apply his ideas on space and time to painting, or music or architecture.. ..I don't have a clear sense of cause and effect in my painting, but it is probably there. John Cage and I became interested in the use of chance in the 50's. I think one of the very primary things that happened then was the publication of the I Ching, the Chinese book of changes, from which you can cast your fortune: the hexagrams. Cage took it to work in his way of making compositions then; and he used the idea of 64 — the number of the hexagrams — to say that you had 64, for example, sounds; then you could cast, by chance, to find which sound first appeared, cast again, to say which sound came second, cast again, so that it's done by, in that sense, chance operations. Instead of finding out what you think should follow — say a particular sound — what did the I Ching suggest? Well, I took this also for dance.